Shogun 2 is the Total War series back on form, and boasting the most outrageous hats in martial history. Totsugeki! I had to rub my eyes. How could this have happened? Scant turns into Shogun 2's campaign on the Hard setting, and I'd conquered my first city. My early-game army was already marching toward the next. Then one of the other clans landed a naval transport next to my home city and walked a small army right in. Total War's AI, it seems, doesn't have trouble with ships any more. Thus began my army's panicked march home to retake its own capital. Dismay, bedwetting, and the thrill of a fateful challenge: a good opener for ten. Set, like the very first Total War, in the Sengoku period of Japanese history, Shogun 2 recalibrates the scale of the series in both geographical and military terms. After the multinational splendour of Empire and the continental romping of Napoleon, it narrows the focus down to a single geographical location and fewer troop-types. The Sengoku ('Warring States') period seems a natural step; it's the perfect backdrop for a multi-faction strategy game, and the martial culture is fascinating. By 1545, when the campaign-game begins, the ruling shogunate's reach had dwindled, leaving Japan a shifting Venn-diagram of growing clans. Within this lay the seeds for Japan's ultimate unification under the Tokugawa clan – and here's where you intervene. As Daimyo, or clanleader, your task is to increase the power of your own clan, conquer or subdue the opposing clans, claim the seat of power in Kyoto, and, ultimately, form the new shogunate. Even for those accustomed to Total Wars past, Shogun 2's armies look fabulous. Each unit-type features incredible levels of detail. Zoom in close, and individual touches pop out at you: a full-face demon-mask here, an unusually crested helm there, a moustache... Creative Assembly have raised the technical bar too, with wonderful season-specific effects, specularity and downright splendid texture-work, especially in the rain. The accents and intonations of the campaign and battle advisors are also fantastic, especially when things get heated. You can almost hear the spittle flying when your battle advisor yells, with great emotion: “Our troops are running from the field! A SHAMEFUL DISPLAY!! !” And the music matches pace. From the airy, atmospheric, intrigueheavy string-and-flute music of the campaign map, to the drum-andgong- and-grunting-Samurai martial accompaniment to battles, the sense of atmosphere is palpable. As ever, there are two phases of play. A turn-based strategy layer, in which you manage your clan and decisions take seasons to play out, and a real-time battle mode, in which you lead your armies to victory or humiliating defeat. Early on, diplomacy is key. Even more so on higher difficulty settings, where you'll find the AI working the clans hard, and you even harder, with bullish demands accompanying every overture. It gives the clans a strong sense of personality: they come to you more frequently with offers, but they can be ruthless in their exchanges, and prone to breaking off relations. They also gather bigger armies on higher difficulty, and are more proactive about expansion. With alliances come serious responsibilities. Attacking an ally is deeply dishonourable, and while it may gain you territory and the production capabilities of captured cities, it also reduces your Honour, a factor contributing to your peoples' contentment and the way other clans perceive you. After an experimental backstab, I spent a hell of a lot of turns paying for my land-grab with broken alliances, reduced trade and the resultant economy-hit, followed by civil wars as angry peasant-armies rose, and major hostility toward me from other clans. As with the earlier games, special agents can be recruited to tip the balance on the map, and their influence can be pronounced. The Ninja is a highlight. His Subterfuge and Assassination skills enable him to lock down an army for a turn or slay its general, and if you point him at an enemy castle, he can sabotage key production structures within, or its very gates – a beneficial precursor to a siege. Monks, Geisha and Metsuke – the era's ninja-sniffing secret police – are also available to perform a range of covert offensive and defensive actions. All these units can level up with use. Halfway through my first campaign, diplomacy ceased to be an issue when realm-divide happened. This happens at different points in each game. When the AI assesses you as the biggest threat on the map, the Shogun decrees that you're the enemy, and all the clans fall into line. A design feature to stop you sweeping effortlessly to victory, it changes the pace of the game remarkably: suddenly you're under siege everywhere. To keep things interesting in the meantime, events, missions and dilemmas pop up periodically. Winning a mission (by researching a specific skill, say) confers turnlimited benefits to your clan - a military or civic buff, perhaps. Balancing military and civic development is crucial. Every now and then it's wise to turn your techtree research away from Bushido (fighty) towards Chi (civic). This lets you unlock new farming techniques and tax-improvement technologies, as well as advanced structures and agent improvements. However, civic navel-gazing won't win you any battles. Idling armies hoover resources and offer no recompense, and you need to conquer a set number of provinces to win. Kyoto, bang in the centre of the map, must also be yours. So war it is. The defining characteristic of Shogun 2 is its refinement of troop variety from more recent games in the series. Good old-fashioned infantry, archers and cavalry form the backbone of your armies, with the odd clan-specific exception. According to which structures you build and which technologies you research on the tech-tree, they come armed and armoured in a variety of ways for different battlefield roles. Befriend western traders and adopt Christianity (gasp! ), and gunpowder weapons are yours, at the cost of social and diplomatic enmity. The bulk of your force begins with Ashigaru – essentially peasant conscripts – and shortly after, Samurai: disciplined, resilient, better-equipped and with considerably fancier hats. Yari (spear) Ashigaru and Bow Ashigaru are available as basic recruitment options in any town, but with suitable development, Monks, Ronin, and battlefield Ninja units become available, which tend towards specialisation in one statistic at the cost of another. Attain the top techtier of any school of weaponry and build its related building, and you can recruit high-stat legendary units, though the recruitment cap for these is extremely limited. The direction in which you push your tech-tree, and therefore your army development, is dictated by your clan-specific perks. The Takeda clan, for instance, receive improved morale, recruitment costs and upkeep costs for all cavalry units, and can recruit superior cavalry. Another clan might benefit more on the campaign map, with bonuses to diplomacy and campaign-map agents, such as Ninja, Geisha and Metsuke. And in the traditional Total War way, each clan also differs in challenge according to its position relative to friendly or hostile clans, regardless of the difficulty level. Both the campaign and battle AI seem to have taken a turn for the better since the days of Empire. Naturally, it's no great challenge on Easy: enemy clans lack creativity in battle, and tend to build smaller, lessadvanced forces. But ramp it to Hard (I'll admit, I'm too scared to play on Legendary), and the game changes completely. 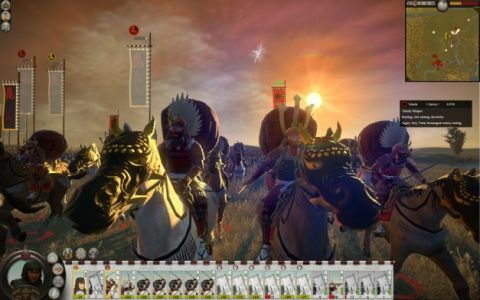 Besides being more aggressive in battle, the AI uses cavalry well, as a flanking or rearattack force. Point spears at those horsies, and they'll wisely hang back, probing for opportunities, biding their time. Try the same trick with your own cavalry, and the AI will keep his most suitable spear units on high alert. Thanks to some tiling cleverness, the battlefields themselves now even more closely reflect the terrain on the campaign map. If your army commits while in a narrow pass, a mountain to one side and a forest to the other, that's what you'll see on the battlefield. This extends to naval combat too: any relevant coastal features make an appearance, giving battles a real sense of location. It's not just for show. The AI exploits that terrain well. If there's a hill nearby, he'll invest it, arranging his troops in a good defensive formation with bowmen on the front line, who'll then retreat back through his blade-and-spear infantry if conflict draws close. The game is generally less helpful to you at harder settings, too. AI morale is more robust – not that you can tell from any visual cues, as the unit morale-bars present at easier settings are done away with – and units in woods are hidden from opponents. With armies of equal composition, you'll have a properly challenging battle with a hard AI. The AI doesn't appear to have any problems launching naval assaults, in case you missed the first paragraph. The only criticism I've found so far is that when its arrows are spent, the AI isn't good at committing its archers as melee support. They're crap in combat admittedly, but during a siege, they'll just stand at the foot of the wall looking stupid when they could tip the balance with a cheeky flank-attack. Time will tell if Shogun 2 has worse sins to commit, but in the time I've spent with it, the AI shows marked improvement. Sieges are a more refined experience, and whether you're attacking or defending, they offer a pleasing geometric puzzle of shifting, courtyard-to-courtyard combat, based around the concept of the defender drawing the attacker through heavily defended killzones. There's the usual arrow-whittling to contend with, but given the limited number of arrows available to any bow-unit, this is usually dispensed with early on. Nor are siege weapon options what they are in the west. Eventually you can research mangonels, and trade with the west for cannon, but that's about it, and they slow armies down something rotten. The fun is in cracking the nut with infantry. Multiplayer has received an overhaul – for the better. While Napoleon introduced drop-in games and cooperative campaigns, Shogun 2 expands the experience to clan-play and long-term progression. Your first job is to design an avatar, then take him on a career to conquer the territories of Japan on the multiplayer campaign map. He begins at rank 1, with basic land and sea units available, and each state he conquers confers experience points and unlocks a new unit-type, technology or retainer to take into future battles. As in the singleplayer game, retainers confer bonuses to your general or army, or apply debuffs to enemy armies. Progression comes from a number of sources. Alongside expansionary unit-unlocks, your avatar has his own skill tree, which is explored with points earned by ranking up, and unlocks battle-abilities and buffs for your general or his overall army. Achievement-hunters will be pleased to note that Steam achievements also unlock new pieces of armour for your avatar, and there are real benefits: full armour-sets grant new retainers, with unique effects. The neat clan system drives people toward community play. The clanleader can assign target provinces on the multiplayer campaign map for everyone to attack – which may or may not offer an unlock you want – but if enough clan-players choose it for the site of their next battle and win, that clan's leaderboard ranking rises. Winning battles also earns your units veterancy, with its commensurate stat-buffs. The really clever thing is that any given battle matches similarly ranked players from the pool of those currently available, so there's no extensive waiting around. Unit costs for deployment are affected by rank and veterancy, so if you're playing a same-rank player with seasoned units, he'll pay more to field them than you do. It's a massive re-think; quite how broadly it'll be embraced is impossible to guess, but the aim is clearly to create balanced, community-orientated games with a long-term sense of progression. You can just crack through an oldfashioned head-to-head game if you prefer, and the co-op unit-sharing feature, where a pal is designated control of your cavalry, for example, is a lovely touch. Throughout, this is a game with a sense of design that makes it a pleasure to play. Every unit-card, every interface panel and every menu option is painted in the style of medieval Japan. Dry, technical descriptions are spiced with a little splash of flavour-text, such as a haiku, an aphorism, or a famous quote. You just have to flick through the in-game encyclopaedia (built with Google Chrome, fact-fans) to see some wonderful examples. Shogun 2 demonstrates an admirable re-setting of Total War's sights. It's a tighter, more focused experience than the continental sprawl of Empire and Napoleon, sacrifices none of their intricacy, and brings improved AI to the battlefield. In the final count, it's consistently thrilling, grand in scope, surprisingly atmospheric, and bloody hard to put down.